A crying girl whose family was burned alive and killed in airstrikes, a wounded man who believes that a quick death is better than his suffering now, and others, grieving, desperate and injured. These scenes are what RT saw visiting a hospital in Yemen. The majority of the patients in this hospital are “in critical condition,” and the prognosis for them is not positive, Ahmed Al-Shibabi, a doctor at intensive care and burns unit told RT. “Burns of 70-90% are considered as critical all over the world. Most of the patients will die. Some already have, while others are in intensive care or in other departments,” he said. 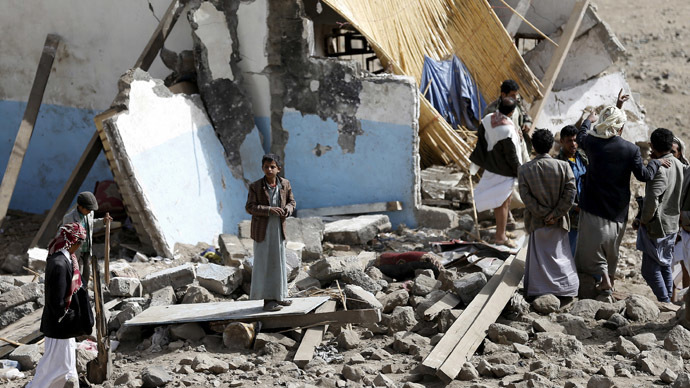 In March, five Gulf States and Egypt launched airstrikes targeting Shiite Houthi rebels, who had seized the Yemeni capital and large territories in the west of the country. Jordan, Sudan, Morocco and Pakistan also expressed their willingness to join in the military operation. The death toll in Yemen has been rising since the Saudi-led assault began, rising to at least 560 people dead and 1,768 wounded – most of them civilians – the World Health Organization (WHO) said Tuesday. Around 100,000 people are also said to have fled their homes. According to UNICEF, at least 74 children were killed and 44 wounded in the strikes since the operation in Yemen has begun. “They are being killed, maimed and forced to flee their homes, their health threatened and their education interrupted,” Julian Harneis, UNICEF's representative in Yemen, said in the statement. Many injured do not have the infrastructure to reach local hospitals, Médecins sans Frontières (MSF) said.